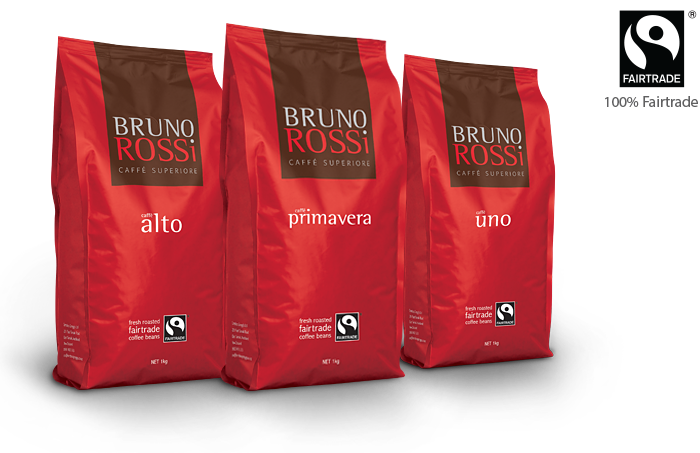 Coffee & Equipment are proud suppliers of Bruno Rossi! Especially as all their blends are now 100% Fairtrade certified and sourced from Fairtrade producers. Inspired by Italy’s love affair with espresso, the Bruno Rossi range features blends that are tailored to suit New Zealand’s coffee culture while celebrating the Italian inspired heritage of this espresso brand. It’s more than consistently, seriously good coffee. Bruno Rossi have carefully selected, roasted and blended the best beans, to deliver the full body and flavour that discerning coffee drinkers love. Cafe Uno is full-flavoured with a nutty and chocolate aftertaste. Medium roasted to produce a balanced coffee, with a rich strong edge. Uno beautifully cuts through milk to deliver a fantastic white or creamy black coffee every time. Cafe Primavera produces a nutty, caramelly flavour, finishing with notes of berry and a floral aroma. Slow roasted for a delicate, smooth and well balanced coffee. Cafe Alto is full bodied with toasty, chocolaty notes and a sweet and spicy finish. Slow roasted to achieve a superior, rich and well rounded coffee.